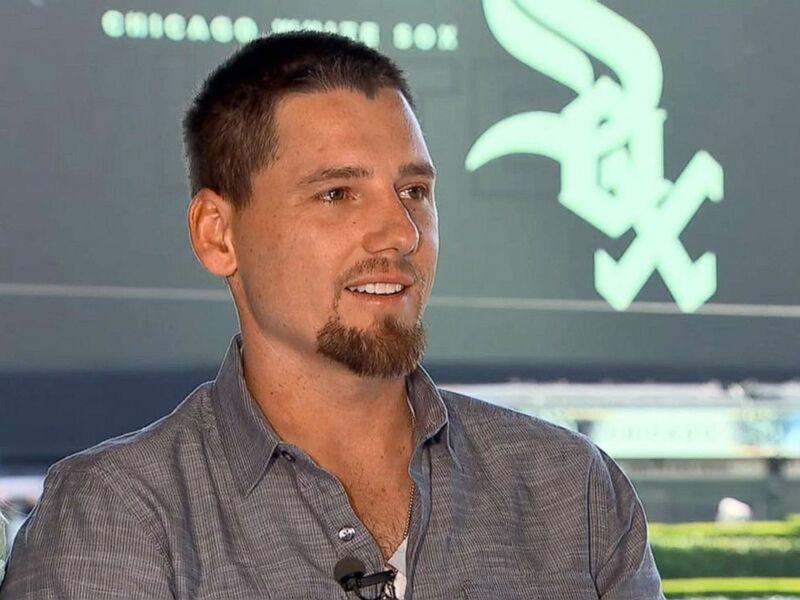 Chicago White Sox pitcher Danny Farquhar is lucky to be alive after suffering a brain hemorrhage caused by a ruptured aneurysm, and now, the dedicated player is focusing on getting his career back on track. On April 21, the 31-year-old had just finished pitching at Chicago's Guaranteed Rate Field against the Houston Astros when he entered the dugout and told the trainer that he had head pains, he told ABC News. Then, he passed out and "immediately started vomiting," he said. The trainer then got him into the ambulance and to the hospital within about 15 minutes, before his wife, Lexie Farquhar, was even able to get down from the suite where she was watching the game, she said. Lexie, 30, was in the suite celebrating the birthday of a team member's wife when she received a call from her mother-in-law. At that point, "they didn't really know what had happened," and she gathered her three children -- one of whom was in the stadium's daycare center -- and rushed to the hospital. 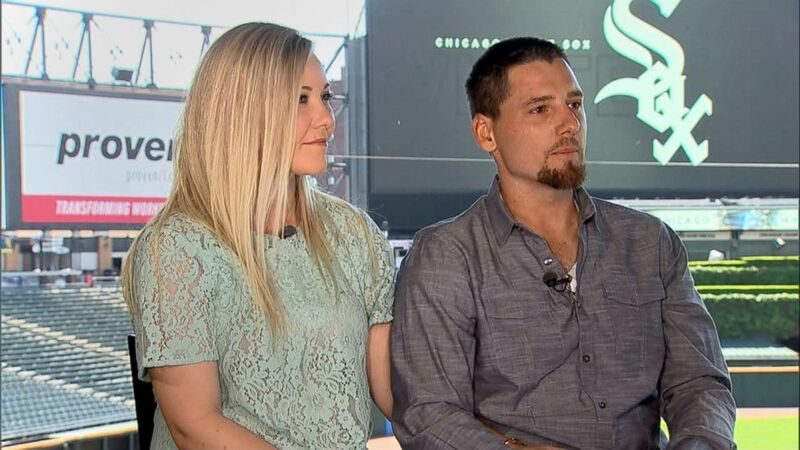 White Sox pitcher Danny Farquhar talks with ABC News, May 31, 2018, with his wife, Lexie Farquhar, following his recovery from a brain hemorrhage earlier this year. Doctors waited for Danny Farquhar to stabilize through the night, and he underwent two surgeries the next day, which involved fracturing his skull and placing two drains to alleviate the pressure of the fluid that was building up on his brain. He now has a scar on the left side of his face, starting at the middle of his hairline and going down past his ear, and a numbness throughout his whole head that doctors say may never go away. Despite his dire condition, there wasn't a moment when Lexie Farquhar thought her husband wouldn't pull through. The couple has been together for more than 15 years, she said. "But, I did know that it was gonna be unlike anything we've ever experienced before," she said. "That it was gonna be something that was gonna take everything we had emotionally and physically, but that he was gonna be OK."
Danny Farquhar remembers nothing from that day, something his wife is grateful for. "I don't really want him to really remember the first parts of it," she said. "So, he gets a pass on that one." Lexie Farquhar said doctors warned her that her husband's loss of memory was going to "be the burden" for her and her family. Danny experienced his first memory about four of five days after he got out of surgery, but it's still "spotty here and there," he said. Before that day, he said he had not been exhibiting any symptoms. He spent 17 days in the ICU after the surgeries. Danny Farquhar has been told by doctors that he's a walking miracle, especially for how functional he is after suffering such a major medical emergency, he said. Doctors told him that about 40 percent of people who experience ruptured brain aneurysms die, and about 60 percent of the ones who survive do so with severe disabilities. 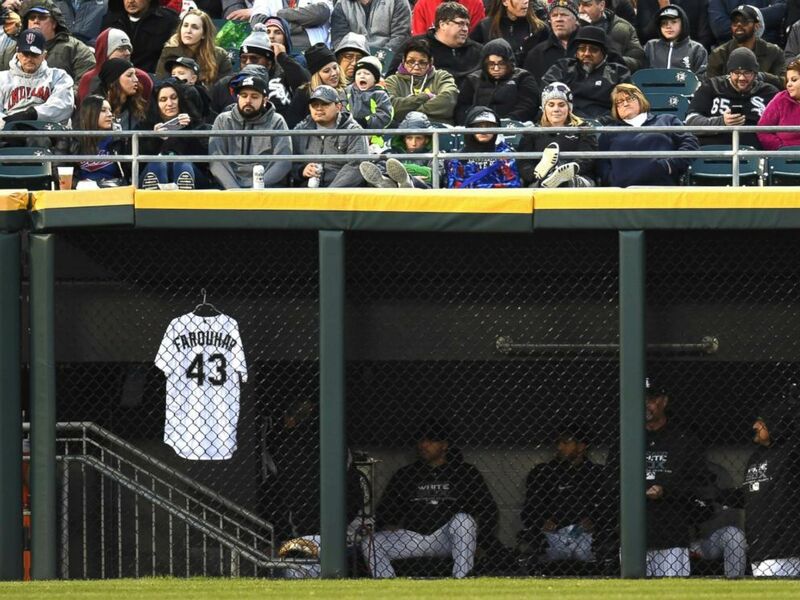 Chicago White Sox relief pitcher Danny Farquhar's jersey is seen hanging in the outfield dugout during a game between the and the Houston Astros the Chicago White Sox on April 21, 2018, at Guaranteed Rate Field, in Chicago, IL. He sometimes wonders what would have happened if the aneurysm hadn't ruptured while he was playing baseball, surrounding by trainers and medical professionals. Not long before that day, the pitcher was stuck in a hotel in Minnesota by himself for three days after because it had snowed more than 2 feet at the time, he said. "I was just thinking, man, if this would have happened when I'm in a hotel room by myself" that he would become "part of the 40 percent," he said. Lexie Farquhar said that she was "so thankful" he was at the stadium when it happened. "Because anywhere else, and I don't think it would have been as good as an outcome," she said. Danny Farquhar of the Chicago White Sox pitches in the seventh inning against the Oakland Athletics at Oakland Alameda Coliseum on April 16, 2018 in Oakland, Calif.
Now, Danny is on the road to recovery, saying that the health emergency "definitely gives you more drive to do stuff, cause you just never know what could happen." "But, obviously, all the prayers that everybody had for me, you know, had some sort of effect," he said. "And God has a plan for me, I just don't know what it is yet." Danny Farquhar has been "completely cleared to do anything" he wants by doctors, but he can't pitch at a professional level, yet, he said. As he builds his workouts, Danny Farquhar must monitor his stress levels and blood pressure and ensure that he does not experience any impact to his head, he said. He's had about eight workouts so far, but he can't lift weights at the level that he used to, yet, because lifting heavy weights raises the blood pressure, he said. 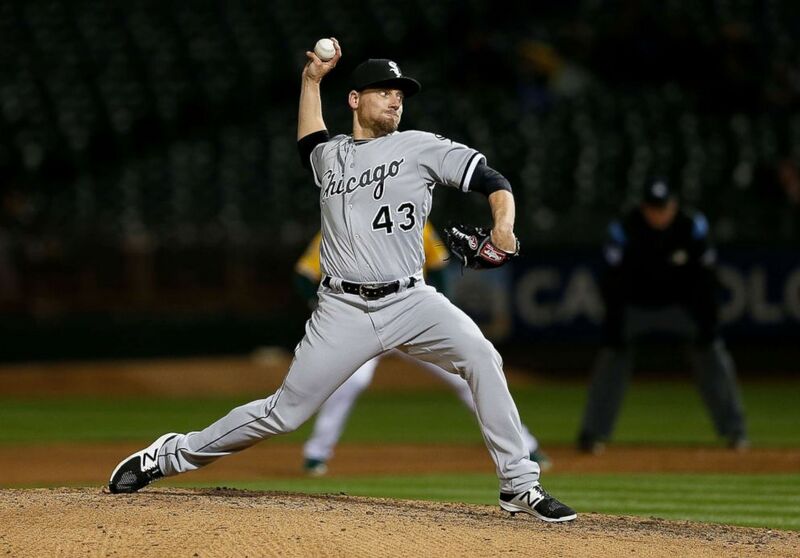 On Friday, Danny Farquhar will throw the ceremonial first pitch at the White Sox's game against the Milwaukee Brewers. It'll be the first time throwing a baseball, other than lightweight Wiffle balls he's been throwing underhanded so that his kids can hit it. White Sox pitcher Danny Farquhar talks with ABC News, May 31, 2018, following his recovery from a brain hemorrhage earlier this year. When asked if he'll be back in the game for opening day in 2019, the pitcher said he's been joking with his wife that he hopes to be back for winter ball in the offseason. "It didn't go over well," he said, laughing. Danny Farquhar said that, even with 28 staples and a drain coming out of his head, he figured he would be ready as soon as he got out of the hospital. "To be honest with you, I was shocked that they put me on the 60 days" of low activity, he said. Lexie Farquhar described her husband as an "outside dog" who "does not like to stay home," but said he's been honest and accepting of his current physical limitations. "He's been true to himself and how his body feels," she said. "He understands that a setback in this will mean a lot more. You can't just push through the pain." Danny Farquhar said he's humbled by the whole experience, adding that he's "thankful" to be on the "good end of it." "The positives are just the outlook on my life and children -- you know, how lucky I am to be here," he said.